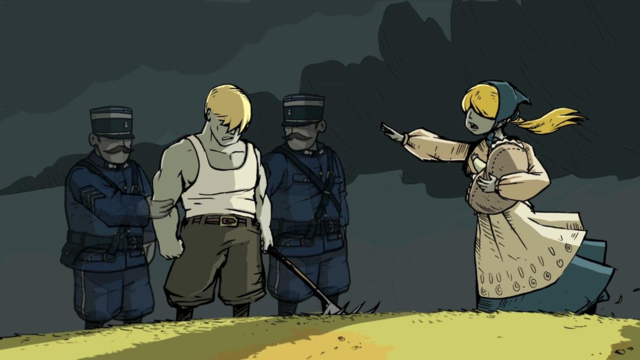 Valiant Hearts: The Great War is developed by Ubisoft Montpelier, published by Ubisoft and was released on June 25, 2014 for PC, PS3, PS4, Xbox 360 and Xbox One. The Neville Offensive. That’s the name of the great attack on the western front, spring 1917, where 200 000 men fell within days. I am located on Chemin des Dames on April 16th when the French Army start their attack to break through the German defense. They are doomed to fail. I can see my friends being torn apart from the hail of bullets from machine guns and their artillery is pounding us. Every step through the mud is going to be the last for someone. It’s a hopeless battle in a hopeless war. 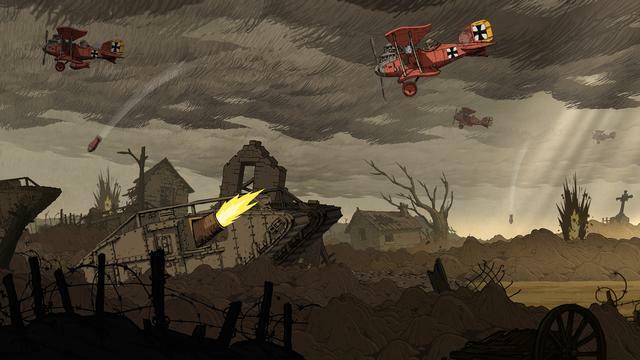 I find it peculiar that Ubisoft Montpelier chose World War I, it is a rather difficult war to make a game out of. Partly because it excludes USA, risking lower sales in that market, and partly because fighting in foxholes easily gets monotonous. Third, the lack a main antagonist like Hitler and his Third Reich to unleash our frustration upon is evident. Still, I applaud the decision, and the fact that they choose to place us here without a gun in our hands. 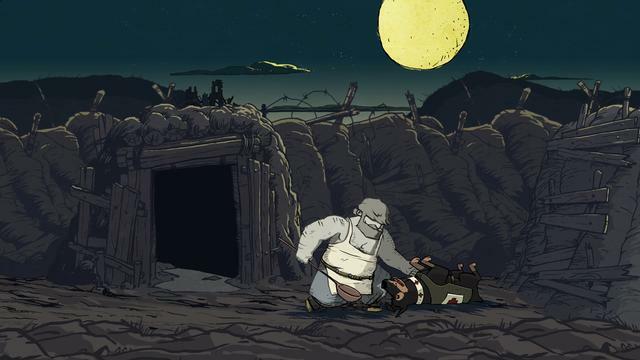 I never fire a shot in Valiant Hearts: The Great War. I never point my gun at anyone’s head, I never pull the trigger. Not once in 8 hours of gameplay. When I do cause destruction, it is by tank or artillery, but I am never put face to face with the enemy. The core of this game is solving puzzles. That being said, death is definitely present here. It’s breathing down my neck, crawling under my skin. It is with me in the trenches, in the tunnels and in the bombed out towns. No matter where we are, the consequences of war are in our faces, ambulances patrolling back and forth to the front, the long lines of hungry soldiers, or headlines on newspapers informing us about the progress of war. The game constantly switches between characters, and after a while you get a pretty impressing overview on the entire situation. During the game, we follow the lives of four individuals, five if you count Walt the dog. German citizen Karl, living in France with his wife and son, called home at the outbreak of war. Emile, Karl’s father in-law, called in to fight for the French defence. Freddie, an American with a personal vendetta towards a German general, and Ana, a nurse from Belgium, living in Paris. She defies her father by going to the front to aid the wounded. Their faith is tied together by history, some more than others. The journey of Karl and Emile is the base line in the game, and it is a very emotional one. Ana never tells her story to such an extent that we get to know her properly, she remains a protective nurse, always around to help. She does try to save her dad in the first two chapters, but after that, her role is nothing but that of a sad supporting actress. Freddie is much the same, his story feels more like a footnote than anything else. Walt the dog is a part of the journey most of the time, no matter what character is in play at the moment. He might even be the biggest hero of them all. With simple commands, I can use him to fetch items, push buttons or dig up stuff. Although his dialogue consists of barks and growls, he is most likely the most charismatic character in the game, and he ties the game together in a nice way. Apart from these mishaps, the story is beautifully written, and with minimal dialog it managed to bring a tear to my eye in the final sequence. The interaction between music and the visual effects does that in a massive way. The graphics are made in a richly illustrated 2D, and Ubiart Frameworks proves yet again the capacity it has as a game engine, and sometimes I stop just to enjoy the beauty that surround me. It is actually so well made that it gets distracting at times. In the most cinematic moments, I died because I lost focus on the task at hand entirely. In one specific scene, Karl is running through the forest. Karl, the trees and everything in the foreground is black, creating a contrast against the starry night sky. All of a sudden a signal flare rips the sky open and the outlines are back. Seconds later, the light is gone, and the forest is yet again a razor sharp, black contrast against the night sky. 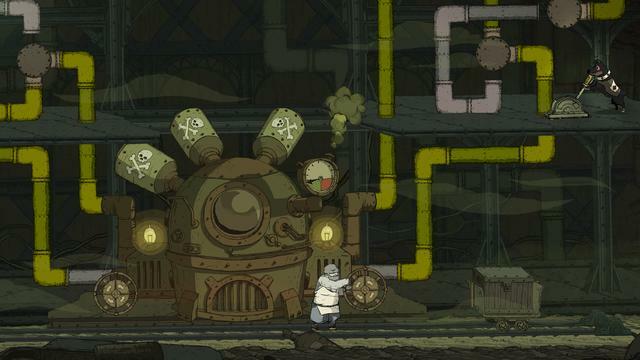 It looks so damned stylish it makes me, with guilty pleasure, wish all games looked like this. And then there is the ending scene. But I won’t go into that here, of course. Ubisoft successfully place the main characters in the middle of several historic events without making it look forced. During the game, I nurse wounded in Marne, participate in the offensive by Chemin des Dames, storm Fort Douaumont, experience the chaos in Ypres and visit the hospitals in French villages. I travel though death and destruction via clever, but simple puzzles, usually picking up something in one place to use it in another. The puzzles you are doing is incorporated nicely, it makes sense to go look for a piece of ham to bribe a guard dog, or to slip a pair of dirty socks into a kitchen sink guarded by two grumpy kitchen assistants. You are not being challenged with too much of a brainteaser though, you will not get stuck for very long before your next move becomes obvious. Then again, it is probably not supposed to take forever to figure out how to get to a key from up on the wall, seeing as there is a war raging on the outside. This is not a pure war game as we are used to see them, but a game about war. In this game, more than most, we get to witness the untamed violence and suffering humans inflict upon each other. The developers are not going too deep into the topics they bring forth though, themes like depression, mutiny and deserting are all topics that could have been given more focus. At the same time, I’m pleased to see that they are present in the first place, and hope it is an indication for future installments. 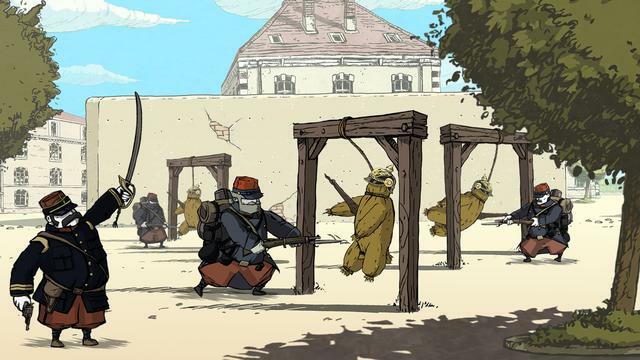 Valiant Hearts: The Great War is a very good game, which could have been even better if we have been given the chance to get to know all the main characters on a somewhat deeper level, and if Ubisoft Montpelier didn’t shamelessly skip certain topics. I’m still left with a tear in my eye, touched in a way that no war game has ever managed to do, and I haven’t even pulled the trigger once. Other developers have something to learn here.